Having broken lower from the first decision point, the US equity market has continued lower, presumably towards the support at the lower end of the long term trend channel. As a reminder, option expiration is tomorrow for stocks, and next week for Comex precious metals options. Did the Flash Crash probe the way lower? 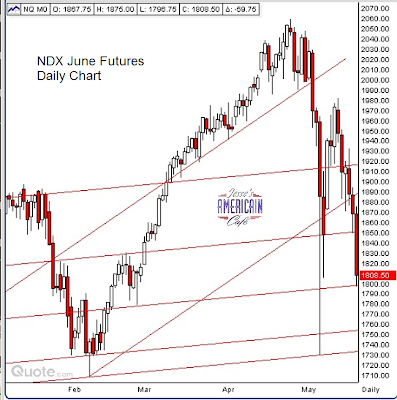 Traders, and I am one, are notoriously superstitious and suspicious about such unexplained movements, suspecting that they are exploratory and will likely be retraced. Well, we’re there. Wash and rinse. Wax on, Wax off. Make it on the way up, and on the way down. As long as you are fleecing the sheep. That is how you gain a perfect trading record, if you are dealing the cards, playing with guaranteed house money, and peeking in everyone’s hands, if even only by milliseconds before they make their plays. Get them buying hope, and then selling panic. It’s all good if you can keep the money moving across your tables. If that support does NOT hold, we’re not in Kansas anymore Toto. But some sort of bounce seems more likely at the moment. Ben has not yet begun to print. I think they’re just negotiating terms and turf right now. 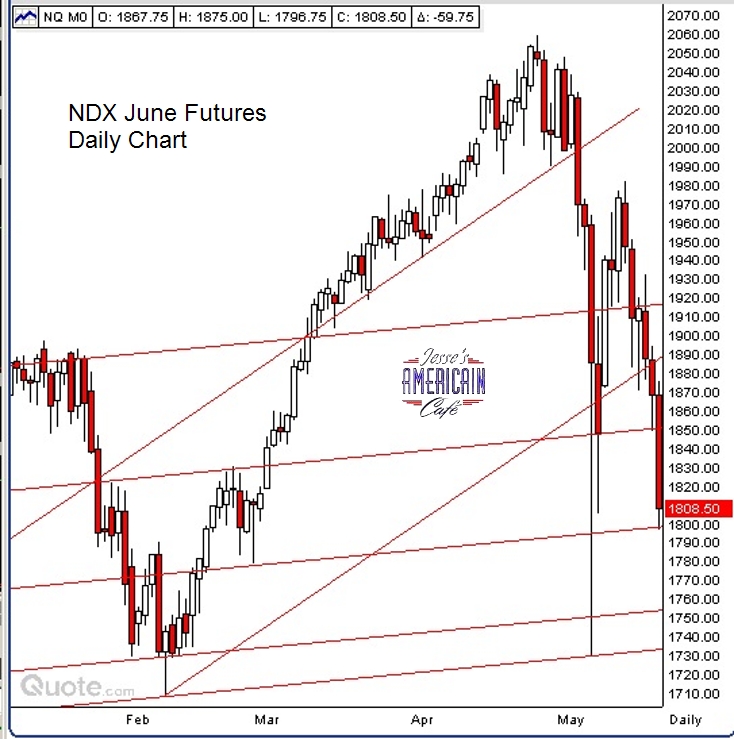 Later: Here are the NDX June Futures going into the NY close of trading. The futures were selling off HARD led by the financials. The SP futures were looking for traction again around that key 1070 support and barely hanging on, with a similar story around 1800 support on the big cap tech NDX. The SP futures have a definite shot at the prior lows in the overnight trade. Gold and silver spot was holding the exact levels where I would have expected them to find something to hang on. Let’s see stocks go into option expiration tomorrow. There are a lot of calls that are going to be expiring worthless. I wonder if they will try and jam the puts for a little whipsaw action.